Can’t grow a beard? This is THE ONLY GUIDE you’ll ever need to change that! 😀 Why do I say that? Because today we will be going over all the science on how to grow a beard using minoxidil (the active ingredient inside rogaine). Yes! Yes it is. And we now have empirical evidence / scholarly research to support this claim (more about that in a bit). Let’s get right into it! Here’s a list of everything we will be discussing. Note: if you just came here for the before and after pictures, click here. 1 What Is Minoxidil (Rogaine)? 2 How Does Minoxidil Work? 3 Minoxidil for Beard Growth. 5 How to Use Minoxidil for Beard Growth. 6 How to Double Your Minoxidil Beard Growth! 7 What Can I Expect? When Will I See Results? 8 Minoxidil Beard Before and Afters. 9 Where to Buy Minoxidil. Interestingly enough, its mechanisms of action aren’t fully understood yet. Taken orally it widens small arteries to increase blood flow, and applied topically it seemingly widens hair follicles and prolongs the anagen stage of hair growth. The anagen phase is known as the “growth stage.” The longer the hair stays in this phase, the more new hair fibers are created. Alrighty, now for the fun stuff. As you may know, minoxidil isn’t intended for face use (at least as of right now). However, that hasn’t stopped hundreds of thousands of men around the world from using it to grow some seriously killer beards! Click here for some before and afters. 48 men, between the ages of 20 to 60 were told to either apply a placebo or 3% minoxidil cream for beard growth twice daily for 16 weeks (four months). By the end of the study the minoxidil group saw statistically significant results, and patients were reportedly very satisfied with their progress. The side effects were super mild and weren’t considered statistically different from the group that did not apply minoxidil. Interestingly enough, the researchers also found it was an effective treatment for eyebrow hypotrichosis (thin or receding eyebrows). So ladies, if you’re reading this — yes, you can use minoxidil or rogaine to get them brows on fleek! As for how it works to promote facial hair, your guess is as good as mine. The exact mechanism is still unclear, but minoxidil is undoubtedly an effective and safe treatment for beard enhancement. 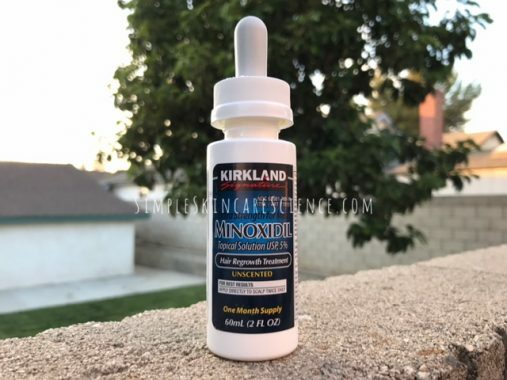 How to Use Minoxidil for Beard Growth. pH balanced cleansers will go a long way in preventing any further irritation that minoxidil might cause by keeping the skin’s pH at a healthy equilibrium. As far as pH balanced cleansers go, you have a lot of options to choose from. My two favorites are Vanicream Gentle Facial Cleanser and CeraVe Foaming. Related reading: Why the pH of Skin and Products Are Crucially Important. If you’re using minoxidil foam, use half a capful for the whole beard area. Leave the minoxidil on your face for 4 hours. Research has shown it takes approximately 4 hours to achieve 75% absorption or higher. (10) So if you want the full beardifying effects of minoxidil, you’re gonna have to leave it on your face for this long. The absolute minimum amount of time you can leave it on and still get results is 1 hour. However, this will only result in approximately 50% absorption or less, so keep that in mind. As an aside, some people leave minoxidil on overnight. This is fine too. It’s completely up to you what to do. Just keep the golden 4 hour rule in mind. After 4 hours, wash your face or rinse with water. Again, this may not apply to you depending on whether you decide to leave it on overnight. But if you’re applying it twice daily, you’ll want to rinse or wash your face after 4 hours to prevent any further drying of the skin. Moisturize! Yes, this is important. Like I mentioned earlier, the propylene glycol and alcohol content in minoxidil is inherently irritating and could disrupt the moisture barrier. You want to be replenishing the damage minoxidil does with a high quality moisturizer. Make sure to apply moisturizer AFTER minoxidil has dried (approximately 4 hours). You should be looking for a moisturizer that has skin identical ingredients like ceramides, cholesterol, or hyaluronic acid. These ingredients all aid in skin recovery, strengthen barrier function, and provide a lot of hydration. In my humble opinion, the CeraVe moisturizers are the best for this purpose. My favorite is CeraVe Cream. It’s good for all skin types, has a cosmetically elegant and isn’t noticeable on the skin at all. If you’re the kind of person that hates the feeling of lotions, you’ll love this stuff! My full review can be found here. Related reading: Cerave Moisturizer Buyer’s Guide: Top 4 Picks. Wash your face. Preferably with a pH balanced cleanser. Apply 1 mL of liquid minoxidil to the beard area. If you’re using minoxidil foam, use a half a capful. Leave it on for 4 hours. Wash or rinse your face again. Do all these steps one to two times daily! If you skin is easily irritated, use it only once. Don’t worry, you can use minoxidil once a day and still get good results (example included in the minoxidil before and after section). Some have even had success applying it once every other day. How to Double Your Minoxidil Beard Growth! Yes, the results of minoxidil can be enhanced! You’ll need to do four things: avoid potent DHT inhibitors, increase collagen production, use L-carnitine L-tartrate (LCLT) and 10% minoxidil. Let’s break it down. In case you don’t know, DHT (dihydrotestosterone) is the hormone that causes androgeneic alopecia (male or female pattern baldness). However, this same hormone is what actually causes beard growth! Why is this important? Because more often than not, people use products designated for the scalp on their beards thinking it will have similar benefits. DHT = bad for hair on the head (scalp). So make sure you’re avoiding anything that will negatively effect facial hair growth. Here are some examples of common and potent DHT blockers you should stay away from. As an aside, MCT oil a.k.a caprylic/capric triglycerides is fine because it doesn’t contain lauric acid. Note: this is NOT the same as fractionated coconut oil! For more information on which oils are good for beard growth, check out this blog post. And here are two things that promote DHT meaning they are good for beard growth. In addition to that, many many people on their minoxidil beard journeys swear by using Jamaican Black Castor Oil (read the reviews to see what I mean). Alternatively, you can try a Jojoba oil and peppermint oil mix. The type of peppermint oil you use is important! You need “mentha piperita” — this is the kind that studies have shown promotes hair growth. (13) The one I linked above is the right kind. By the way, you should consider subscribing to this guy’s channel. He regularly puts out AWESOME and informative videos about the whole minoxidil beard topic. In my humble opinion, the value and insight he provides is unmatched on this subject. The idea that increasing collagen production helps with beard growth comes from this study. To summarize it, researchers wanted to see whether the addition of a 0.5 mm derma roller enhances the results of minoxidil. They found that it helps produce hair significantly faster than using minoxidil by itself. 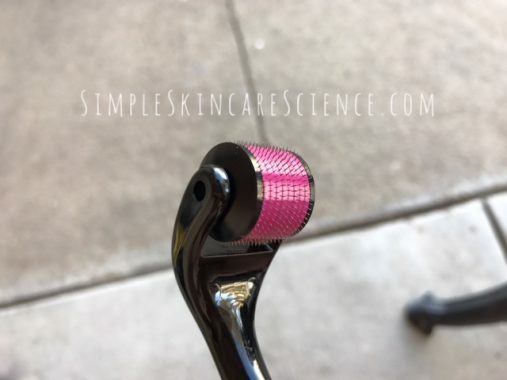 If you don’t know what a dermaroller is, check out my guide about microneedling. I go into depth about the science, what it is, the benefits, how to use it properly, include before and afters etc. 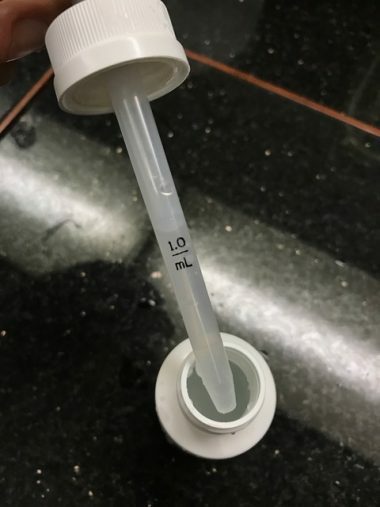 Just make sure that if you’re going to use a dermaroller to enhance the effects of minoxidil that it’s one with 0.25 to 0.5 mm needles like this one. You can use it up to three times a week (start slowly), and DO NOT apply minoxidil for at least 24 hours AFTER rolling. Other topical ingredients that increase collagen production include niacinamide, vitamin c (ascorbic acid), and epidermal growth factors. Here’s a list of products that include these. Epidermal Growth Factor (Human Ogliopeptide-1) Benton Snail Bee High Content Essence (My Holy Grail). Full review here. More importantly, 3 studies have found it promotes hair growth by increasing androgenic receptor sensitivity! (15, 16, 17) This is particularly good because it means DHT (what causes facial hair growth) can be utilized more effectively in the body. There have been many anecdotal reports of people mixing LCLT powder with liquid minoxidil and having increased gains vs using minoxidil alone. Note: the in vivo study above used a 2% application of LCLT. To mimic this, simply add 1/4 teaspoon of 100% LCLT powder into your liquid minoxidil solution (60 ml) and shake it until it’s dissolved! Last but not least, you might be able to double your minoxidil beard growth by increasing the concentration. One study found that there was a dose dependent relationship between hair growth and minoxidil. (19) As of late, several people on the minox beard spot have been reporting great success doing this! The two most popular brands are Mintop 10% Liquid and Tugain 10% Foam. What Can I Expect? When Will I See Results? This isn’t an overnight kind of thing. You can realistically expect to see results within 3 to 6 months. However, continued use delivers better results. The recommended minimum treatment period is 6 months, but most people generally aim for the one year mark. By then, significant progress is made and usually all the hairs have gone terminal. Of course, not everyone is the same. Some people see results very quickly (e.g. 2 weeks), while others require several months. Just be patient and persistent and the beard will come in. By the 3 month mark, it should be pretty clear whether it’s working for you or not. And yes, the results are permanent. Just make sure all the hairs have gone terminal first, or you risk losing a lot of gains. Minoxidil Beard Before and Afters. You gotta give credit where credit is due. 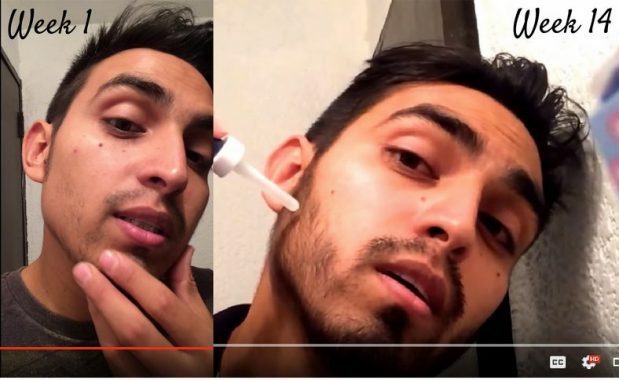 He has a series of videos documenting his journey throughout a year of applying minoxidil on his face once a day. 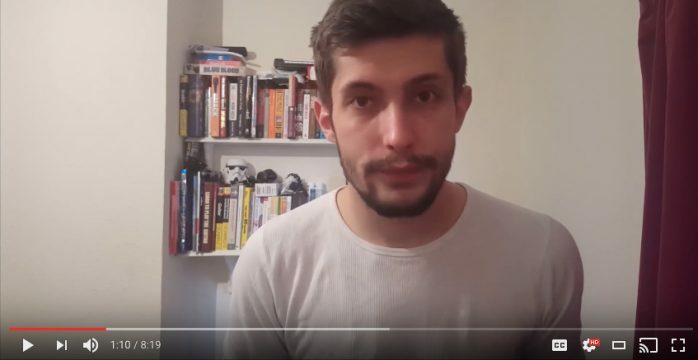 And to help keep you even more motivated, here’s a video compilation someone made of 100 guys who all grew beards using minoxidil! Most of these guys are actually from the minox beard spot facebook group. EDIT: the original video was deleted, but here is a version someone re-uploaded. You can get a 6 month supply of minoxidil on amazon for pretty cheap. As a side note, you don’t have to opt out for the more expensive brands like Rogain. All 5% minoxidil products contain the same ingredients (50% propylene glycol, 30% alcohol, water, and 5% minoxidil). The kirkland brand will do just fine, and is what most people use because of its cost effectiveness. However, if you’re skin is particularly dry or irritated easily then you might want to opt out for the Minoxidil Foam (see price on amazon). This is far more gentler on the skin and doesn’t cause nearly as much dryness — the only cavet being that it’s slightly more expensive. Some people even like to use the foam during the day because it dries more quickly (meaning you won’t have a wet face at work or school), and the liquid at night. Either way, foam or liquid is fine. Both will do the job and provide the same results. Tell your beardless friends about how they can finally achieve their dreams! Share this! I have been using Minox for about 3 months, maybe a little less, and I’m seeing very good results. Prior, I had almost no hair on my cheeks and now I’m seeing the beginning of a full beard. However, in between the hairs on the bald patches, I can’t even see tiny hairs. Are they just too small to see at this point and will potentially appear as they get thicker, or could that mean I’m actually bald there and can’t grow hair no matter what? Hi, thank you for the informative post! I’m a woman though & I use it on my sparse eyebrows & it works wonderfully. I have one question, you mentioned that the results are permanent once the hairs have turned terminal. This might be a stupid question but does that also mean it will grow back if you shave it? Just wondering how much can azelaic acid affect the beard growth? I have some acne in my jaw which I was planning of getting rid using azelaic acid. And afyer, use minoxidil to grow a beard. But I don’t want to affect the effect of minoxidil by using the acid.. I am a women and am interested in using this method to thicken my naturally thin and blonde eyebrows. I assume the amount applied would be much less for eyebrows than beard. Any ideas how much? Also do you have any idea if doing this will darken/thicken existing eyebrow hair? Any other tips would be greatly appreciated. It is true that minoxidil on beard will not work to 40+ yrs old man? if i have no beard and no mustache, will it work? Hi. I just wanna ask where I’ll put minoxidil in my routine. I have vitamin c serum and snail bee essence. Do I put minoxidil after applying those? Thank you! Hey there, thanks for this page and the info you provide. Much appreciated! Quick question for you…this page http://beardresource.com/coconut-oil-beard-growth/ directly contradicts some of the assertions you have made about coconut oil being bad for beard growth on minox. You both conclude it is a DHT blocker, yet the resource I provided claims that the benefits of the testosterone increase more than compensates for any DHT blocking that may occur. Do you agree with that? Do you have any supporting science/studies that confirm your position? Or should I just keep using my minox and coconut oil, because I find it to be a VERY powerful moisturizer. Frankly, I don’t want to stop using it, yet at the same time I don’t want to compromise my future gains. I’m only on week 3 of my minox journey, so I want to get this right! 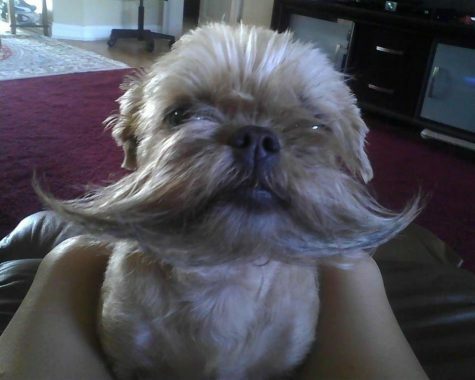 Hi, can i shave during the growth process? I want to have a full beard, but i work in a ship, and during work we’re not allowed to grow beards. So my plan is to keep using minoxidil (I started one week ago, I’m on vacation now) during work, but shaving every day. What do you think about this? Is it better to use 10% Minoxidil? It says it’s twice as powerful as Rogaine. I have a skincare routine consisting of a cleanser (Cerave Hydrating Facial Cleanser), toner (Thayer’s Alcohol Free Rose Petal Witch Hazel Toner) exfoliants (The Ordinary AHA + BHA Peeling Solution, Paulas Choice 2% BHA Liquid, Aztec Secret Indian Healing Clay), serums (Vitamin C, The Ordinary Niacinamide 10% + Zinc 1%, COSRX Snail 96 Mucin Power Essence) and moisturizer (Khiels Ultra Facial Cream, Cerave PM Facial Moisturizing Lotion). My question is can I still use these products with minoxidil? & instead of waiting four hours, can I apply minoxidil after I cleanse, wait a few mins until the minoxidil dries and then do the rest of my skincare routine? I’d really like to continue my skincare routine along with minoxidil, any feedback will be greatly appreciated. Thanks! I didn’t see anything on this post about this so I’m going to ask. 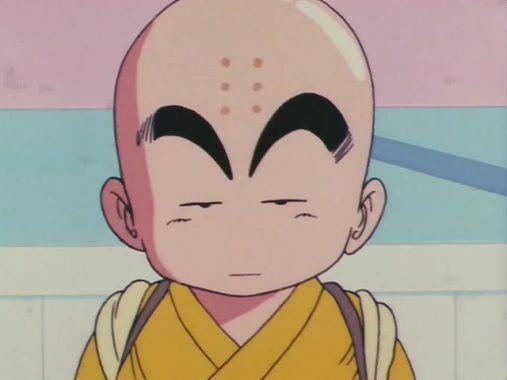 If you use monxidil on your face, it won’t make you lose hair on your head will it? Have you done any investigation into the evidence that minoxidil is toxic to cats? This is the main reason I have been avoiding using minoxidil myself, as I have two cats and don’t want to risk their health. I was surprised to see that this post didn’t mention it at all, as it’s highly dangerous for cats and they can develop symptoms from exposure to very small amounts. I appreciate the work you’ve done putting together this post (and your many others!) and I feel like addressing this would help make this guide more comprehensive. Unfortunately Minoxidil 5% gave me a nasty dry cough, also known as “ACE cough”, and short breath. The ACE cough is a common side effect that can be observed in patients using medication that lowers their blood pressure which Minoxidil originally was used for. It still contains the ACE enzyme. However, the intended effects were crazy. Within days I’ve started noticing hair growth on my cheeks where there has never been hair before. Also, it does dry out the skin insanely. Creaming it a lot is really a necessity. 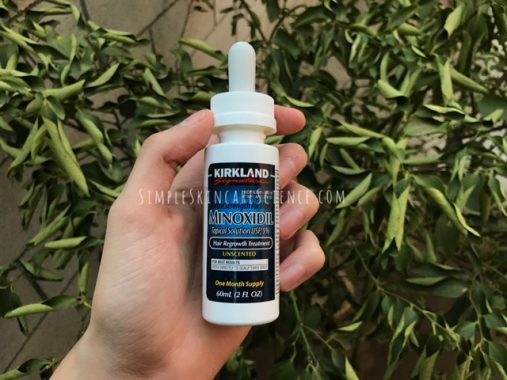 I can live with the dry skin but the cough is bothering me, so now, instead of using it twice a day I only apply it once in a smaller dosage, hoping that I can get the coughing under control. 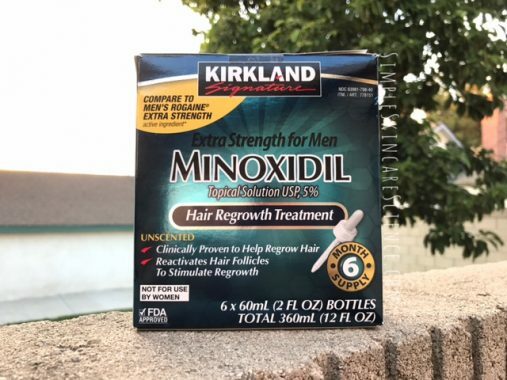 I might switch to Minoxidil 2% if it doesn’t get better, and if I still experience the coughing afterwards I might have to stop using it completely. By the way, as of writing this I’ve been using it for 19 days and I am absolutely positive that the cough stems from the Minoxidil as it started shortly after I started using it. Other than that I feel very fit though. Thanks for the post. I’ve bookmarked this article since I think it’s the most thorough I’ve found. Just one question – Others have written to use up to 2 ml per application (i.e. 2 ml in the morning and 2 ml at night). Do you think using more than 1 ml would speed up the results? I thought Copper Peptides could also assist in facial hair growth? I’ve been doing the minox 2x a day and apply copper peptide in between and leave it on for 3-4 hours. I then wash it off when I bath at night and apply my second minox. Only been on this program a month a week. Not much has changed yet but I vae notice additional hair growth on my sideburns and the vellus hairs appear to get longer. Should I stop the Copper Peptide? Is the ph balanced skin cleanser also effective as a beard wash or do you recommend something different? I use minox but my beard is longer. I was wondering if I should use the CeraVe foam on the part of my face where the beard is sparse and a beard wash on the area of my face where the beard is long? Also, is the pm moisturizer good on beard hair?